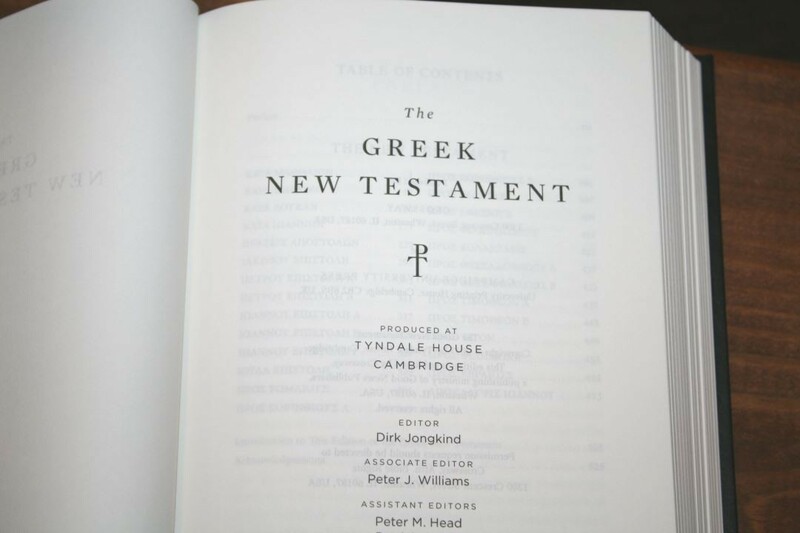 The Greek New Testament was produced at Tyndale House, Cambridge. 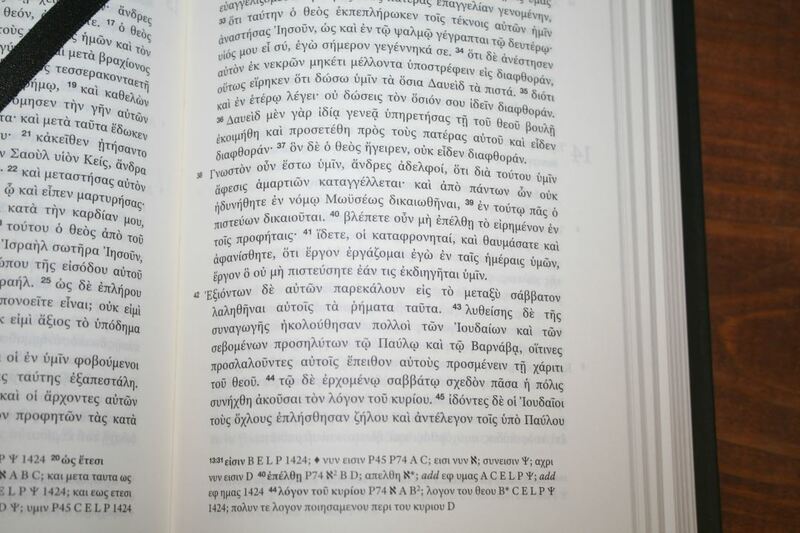 It was a 10 year project created under the oversight of Dr. Dirk Jongkind and Dr. Peter Williams and is a revision of a Greek New Testament from the nineteenth century by Samuel Prideaux Tregelles. They led a team of scholars to reevaluate the manuscripts in order to create this edition. They looked at everything from spelling to paragraph choices, and considered recent discoveries of the scribal habits of the earliest manuscripts. 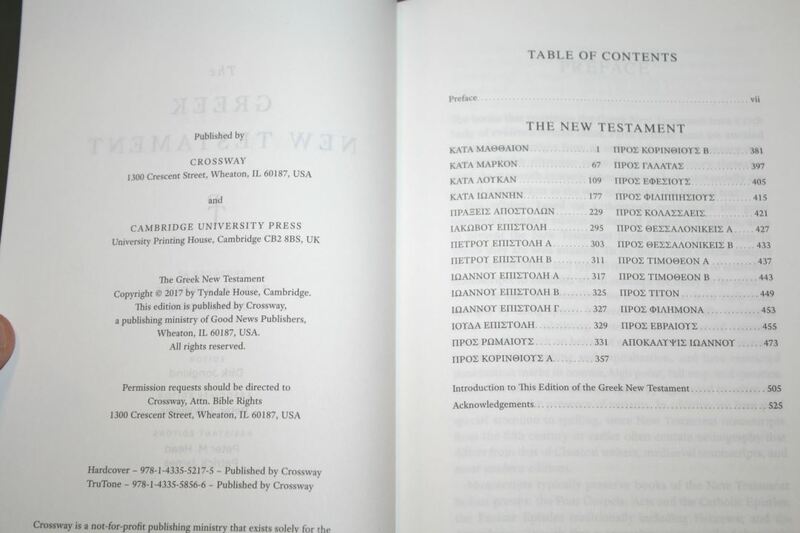 This New Testament was produced by both Cambridge and Crossway. 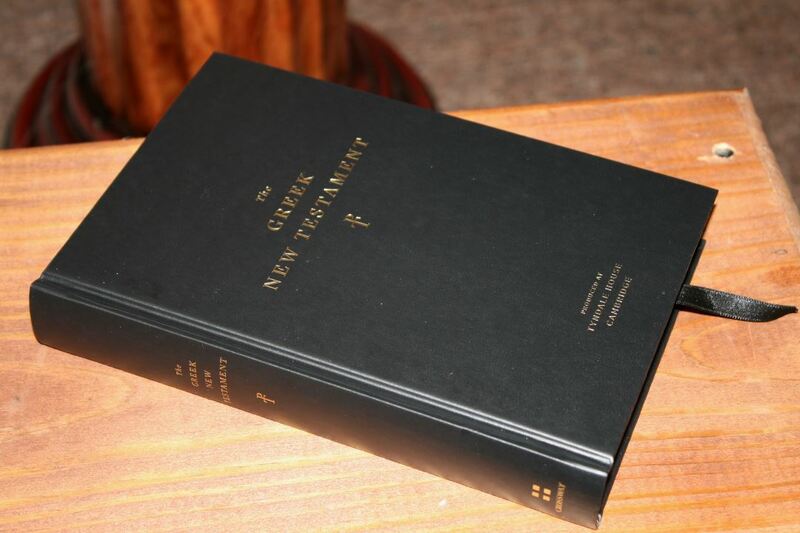 I’m reviewing the Crossway edition, ISBN: 9781433552175. 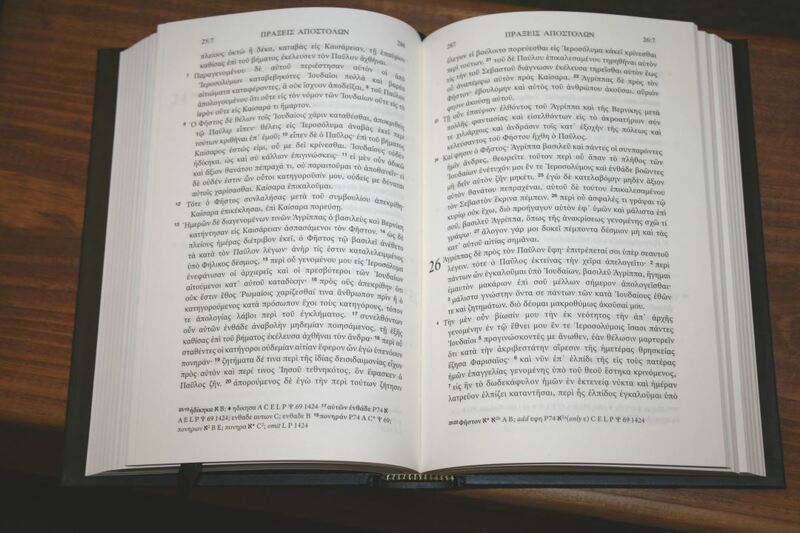 Crossway provided this Greek New Testament free for this review. I was not required to give a positive review- only an honest review. The team looked at three types of variants: those that are close contenders for the main text, those of exegetical importance, and scribal errors with the goal of removing the errors that particular scribes made. They looked at the plausibility of how a mistake was made. For example, the scribe could insert harmonies, meaning that when they know one book and are scribing another they might insert something from the other book because they know the story. 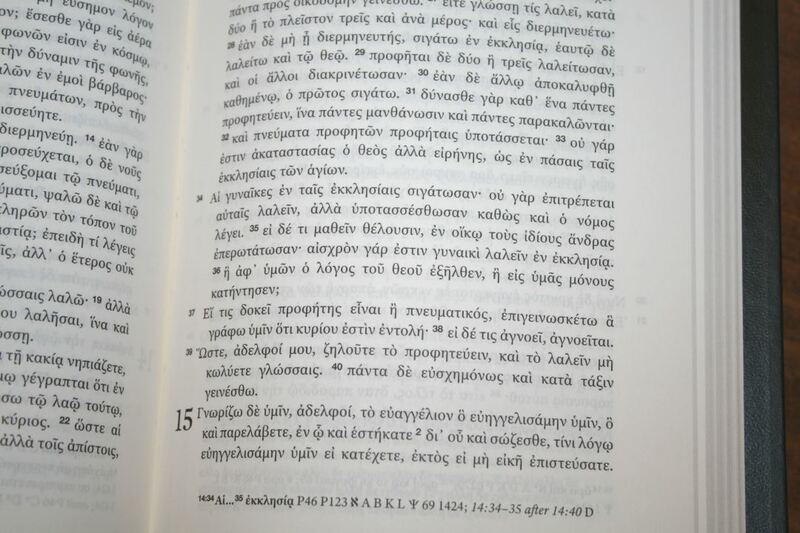 This type of error can be seen between the gospels, when something is recounted somewhere else, or when the Old Testament is quoted in the New Testament. They looked at early papiri such as P45, P66, P75, manuscripts from the 5th century and earlier, and early codexes to ensure that the readings they chose were wide spread. For any rendering they made sure they had at least 2 early manuscripts that agreed. 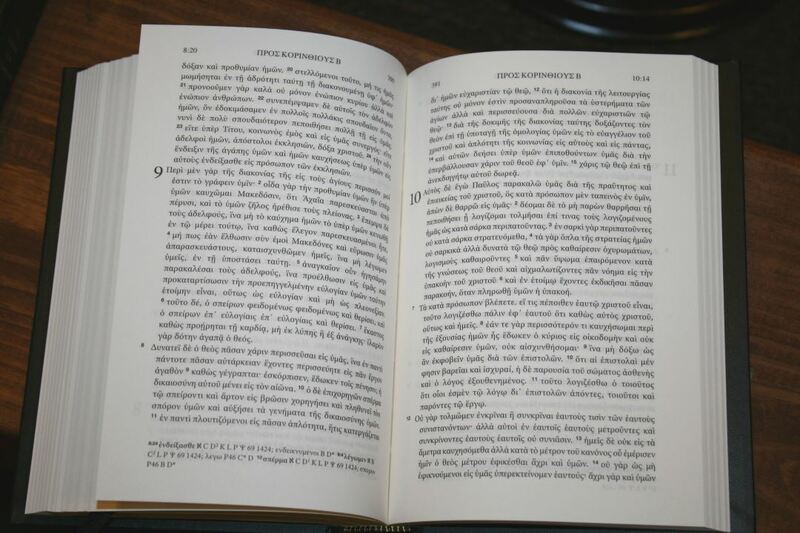 Other Greek New Testaments haven’t done this – even those that use the same manuscripts. The differences are small, but there are a lot of unusual readings, spellings, and paragraph changes. They don’t intend for this edition to take over from the others. They still encourage the others to be used and studied. They intend for this edition to be a documentary of what the manuscripts say about the actual text including spelling, paragraphing, and accents- all following the earliest manuscripts. It fine tunes our understanding of the New Testament without rewriting theology. 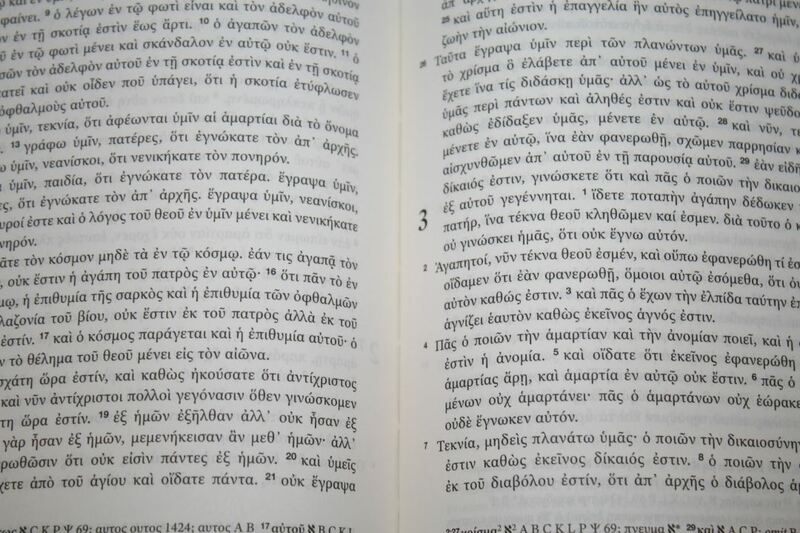 The goal was to get the small details right and to be the most accurate printing of the Greek New Testament. 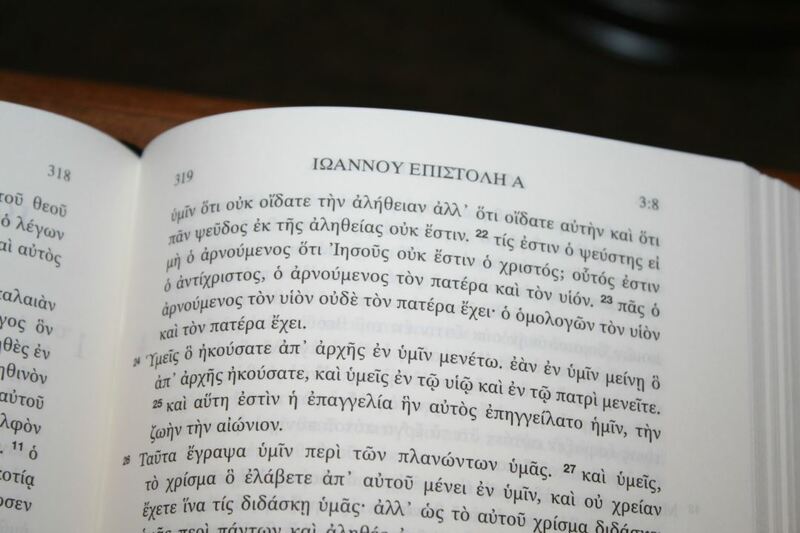 You can study the text itself online for free at ESV.org, which also includes interlenears and contextual, lexical, and parsing information for each Greek word. This is the hard cover edition. It’s a semi-shiny black with just a little bit of texture. 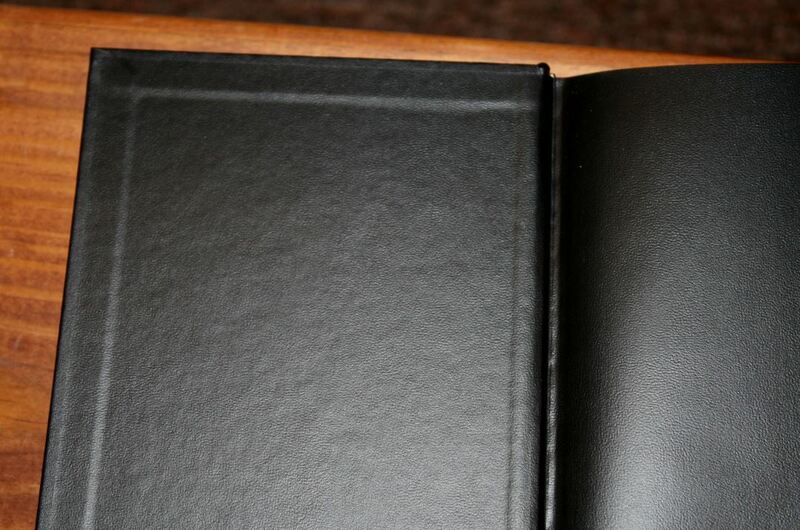 It includes a black vinyl liner. The text on the front and spine is stamped in shiny gold ink. The text-block is Smyth sewn and it includes a black ribbon and black and yellow head/tail bands. It isn’t built like a Bible- it’s built like a high-quality and sturdy book. The overall size is 8 x 5.5 x 1.1″. The paper is 70gsm as is easy to turn. It’s cream in color and highly opaque. It has no glare and is to read from for long periods of time. I love reading from this paper. It includes a sturdy slip case that’s great for storage. 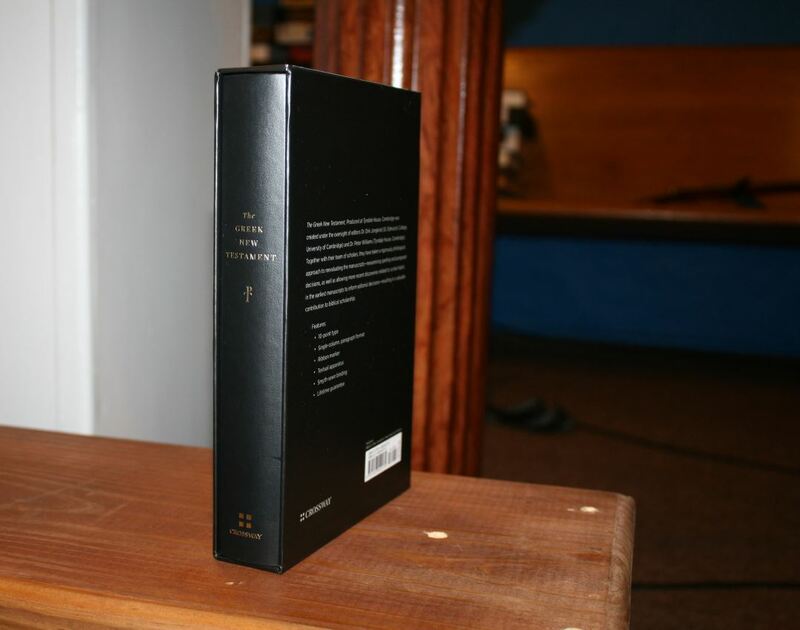 The front includes the same design as the book’s cover while the back includes the product description. The text is presented in single column paragraph. The header includes the book name in the center, the page number in the inner margin and the chapter and verse number in the outer margin. Footnotes are placed in the footer. The text includes lower case letters and space between the words to improve readability. Books are presented in the classic order that’s found in the most ancient manuscripts, which places them into four groups: the Gospels, Acts and Catholic Epistles, Pauline Epistles and Hebrews, and the Apocalypse. The typeface is 10-point black letter. The text is dark, sharp, and readable. It has around 58 characters per line with around 10 words per line. Indented lines have around 56 characters. It doesn’t include footnote keys. It includes chapter and verse numbers and limited punctuation to help reduce interpretation. 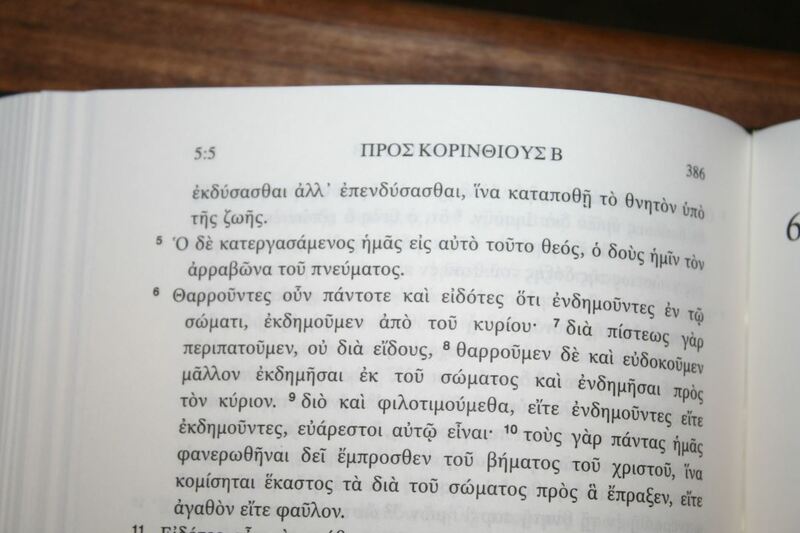 Paragraphs are marked by ekthesis (like the earlier manuscripts) rather than indentations. All lines within the paragraph are indented under the first line. Footnotes are placed under the text. 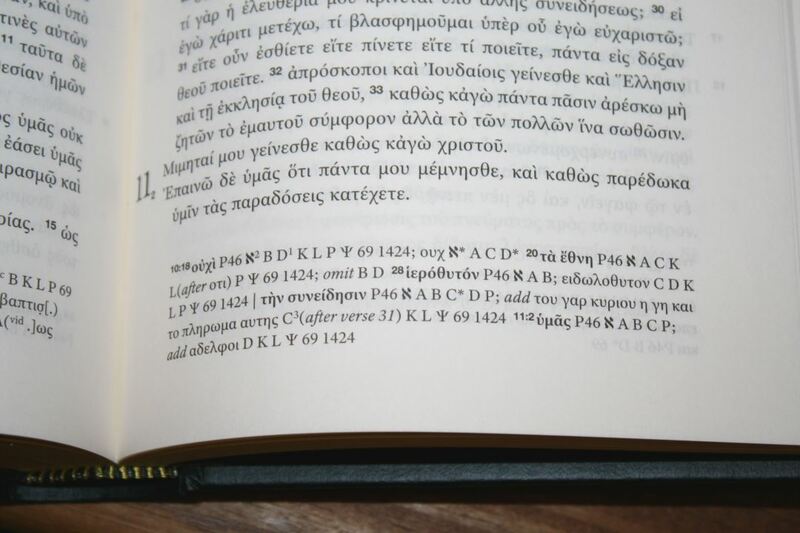 This is an apparatus that shows variations from what is printed in the text. 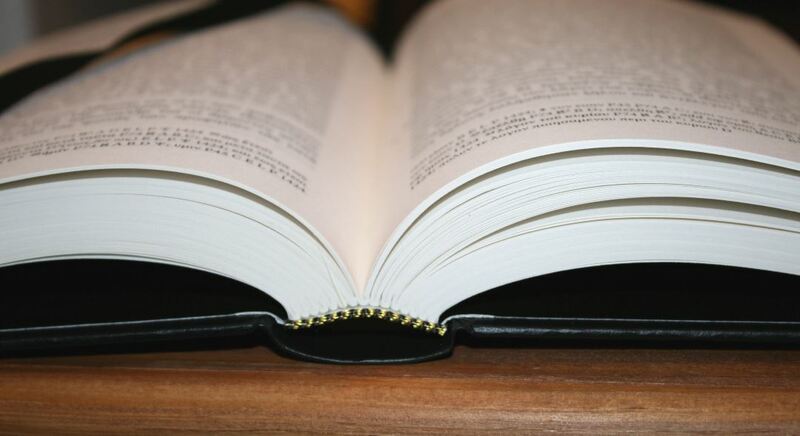 They include the chapter and verse number, the wording from the main text, the list of manuscripts that support it, and variant wordings with a list of manuscripts that support them. 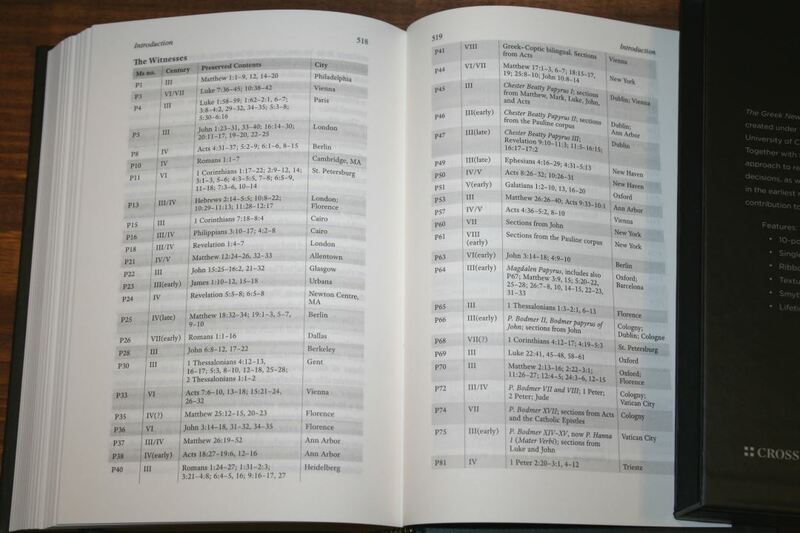 A table is placed in the back that lists all of the manuscripts that were used. It includes the manuscript’s designation, century it’s from, preserved contents, and city. Another short list is provided at the end of the table of additional manuscripts that were consulted. This is an excellent list for reference. 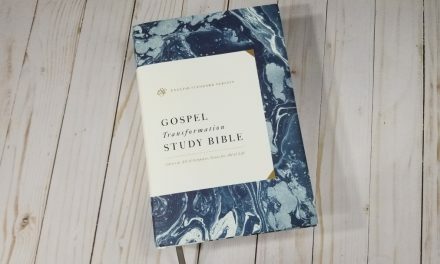 I won’t pretend that I’m qualified to critique the work they’ve done with revising the Greek New Testament, but from what I’ve researched and gathered, this work does look like they’ve accomplished their goal as much as is possible. 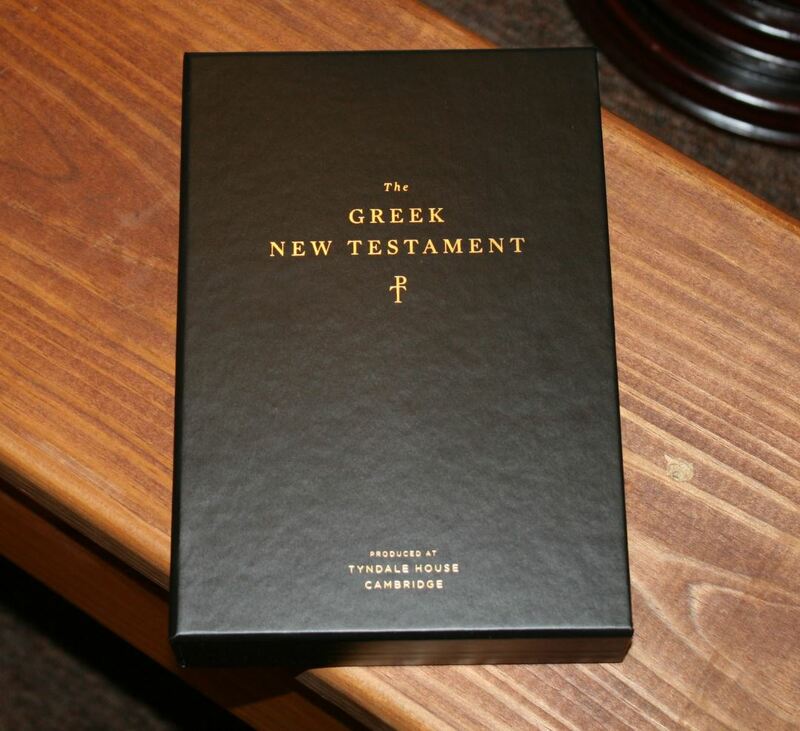 As far as construction and design, they’ve done an excellent job on presenting this Greek New Testament. It’s built well and I love the paper and print quality. I’m not sure that spellings can be completely standardized. I would think that since the original different writers were from different locations and backgrounds they would have different spellings of names. For example, we might expect to see one writer use one spelling and other writers use a different spelling based on the various dialects. The same would go for scribes. Not that I’m arguing with their choices. These are just questions that come to mind. 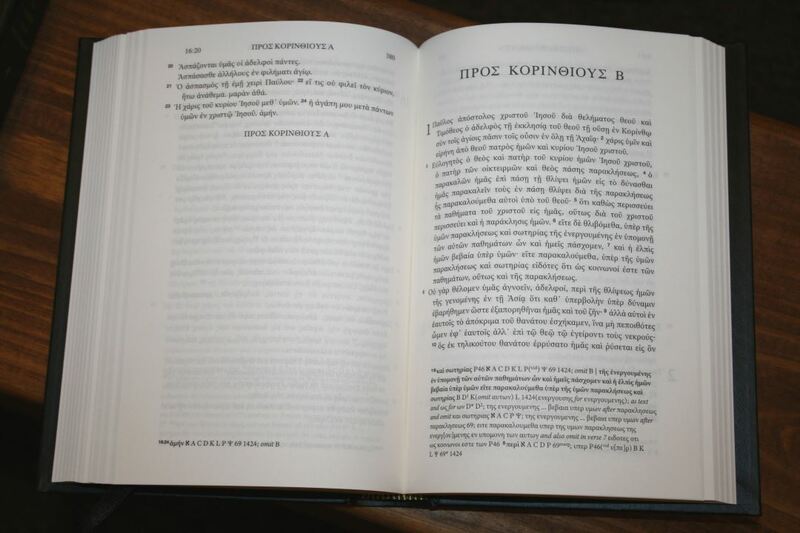 I’m curious if we will see a future edition of the ESV based on this Greek New Testament. I’m also curious to see what the differences would be. For example, could this change the sentence structure and paragraphing in 1 Cor. 14:33-34? Having a different book order does make it more difficult to follow, but since the goal was to match the manuscripts of the 5th century as much as possible it does make sense. 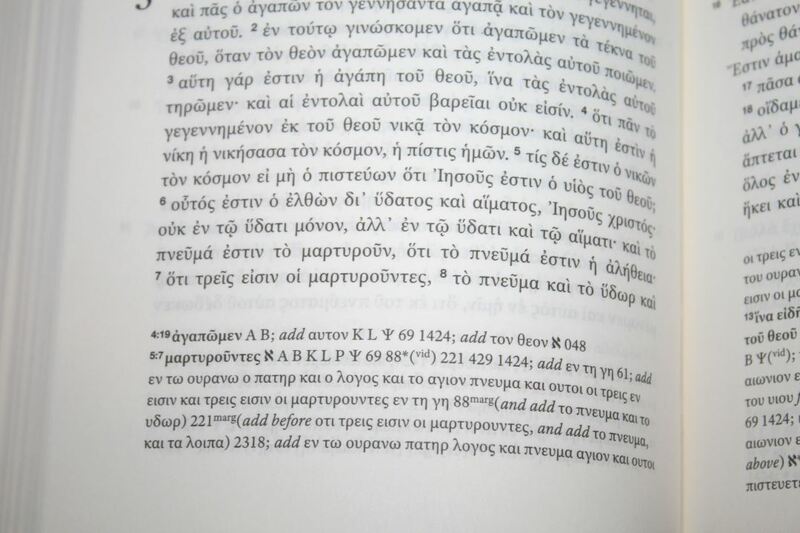 I would like to see the book names in English, but of course that isn’t the point of this Greek New Testament. 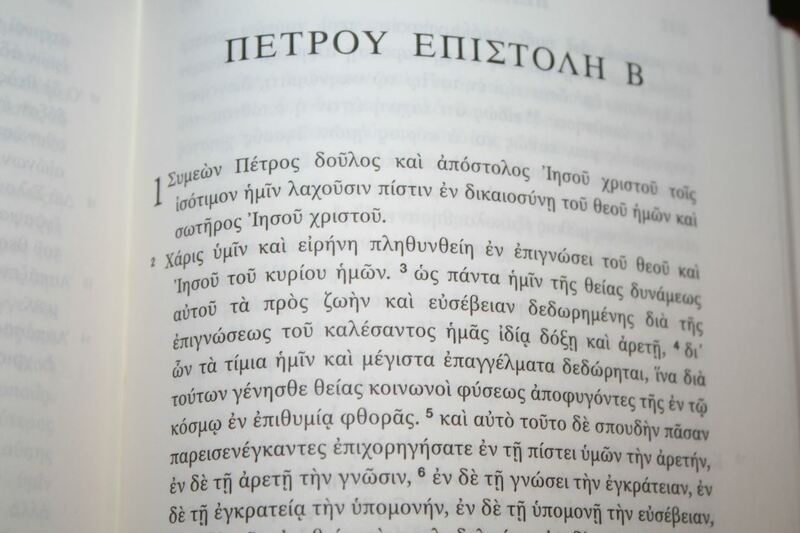 I’d like to see an interlinear edition so we can see the English with the Greek. I think it’s a good idea to go back to the 5th century manuscripts for the words used, spelling, and paragraphing. I think Crossway’s hard cover version is an excellent edition of the Greek New Testament for preachers, pastors, teachers, and scholars. 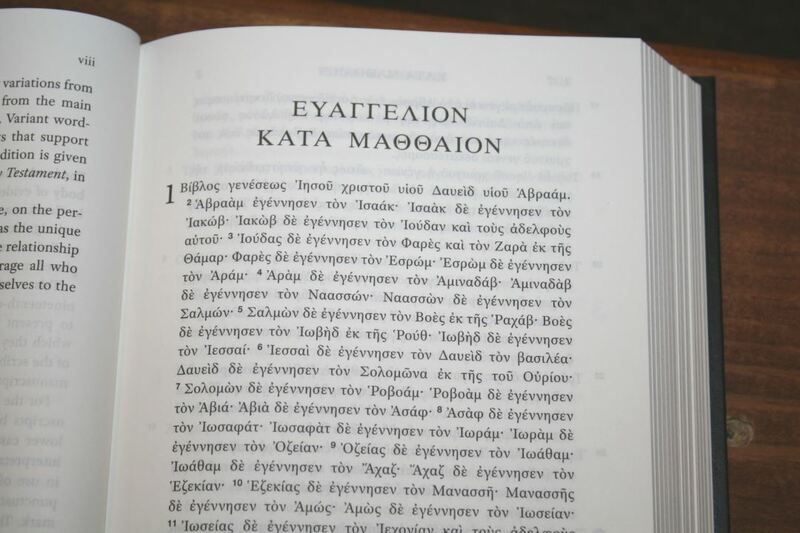 I recommend it to anyone interested in New Testament Greek. It’s available from both Cambridge and Crossway.